Cairo, Egypt, Nov 13, 2008 - Chrysler LLC and the Arab American Vehicles Company (AAV) today officially announced the manufacturing launch of the Jeep J8 multipurpose vehicle at AAV's Cairo assembly plant. "We're pleased to recognize this important milestone and the role of both Chrysler and the Arab Organization for Industrialization," said Hussein Mustafa Mohamed, Chairman, Arab American Vehicles Co. "The launch of the incredibly versatile Jeep J8 and the anticipated demand for its export is an economically significant event for Egypt." The Jeep J8 marks the Jeep brand's return to commercial and military vehicle production with a thoroughly modern vehicle designed to meet the needs of both non-government organizations and government agencies. Originally unveiled at the 2007 Defence Systems & Equipment International military trade show in London, the Jeep J8 is available as a two-door with an extended pickup bed for personnel or equipment transport, or a four-door multipurpose vehicle. It will be produced with numerous vehicle-body and seating configurations in either right- or left-hand drive. The two-door version, for example, can be configured as a personnel carrier with seating for up to eight. "The Jeep J8 combines legendary capabilities and dependability that makes the Jeep Wrangler and Wrangler Unlimited famous, with unmatched cargo capacity and an exceptional towing rating," said Thomas Hausch, Chrysler LLC Vice President - Europe, Middle East and Africa. "The Jeep J8 is also an exceptional value, priced below other vehicles designed for humanitarian and military work." "Jeep vehicles debuted in 1941 as the workhorse of the military," added Hausch. 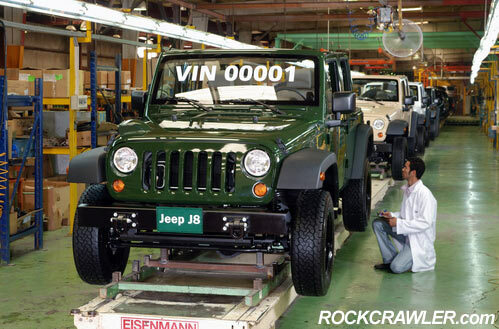 "The Jeep J8 brings us back full circle. With a 67-year reputation for off-road capability and utility in both civilian and military applications, Jeep is the benchmark." With the 2008 Jeep Wrangler Unlimited as a starting point, Jeep engineers increased the vehicle's capability and versatility. The frame of the Wrangler Unlimited is reinforced for increased ruggedness and to allow payloads up to a maximum of 1,339 kg (2,952 lbs.). Axles, brakes and suspension components are engineered specifically for more demanding military and civilian government use, including utilizing a leaf spring suspension in the rear. The J8's Command-Trac four-wheel-drive system allows maximum versatility and performance in both on-and off-road conditions. The Jeep J8 is powered by a 2.8-litre four-cylinder turbodiesel engine that produces 118 kW (158 hp) and 400 N•m (295 lb.-ft.) of torque, providing towing capability of up to 3,500 kg (7,716 lbs.). The engine is mated to a five-speed automatic transmission. The J8 also features a unique air-intake system with special filtration and a hood-mounted snorkel that enables the J8 to ford water up to 762 mm (30 in.) deep and operate in sandstorm conditions for up to five hours. While not designed for front-line combat operations, the Jeep J8 is fully armor capable and excels in a variety of duties ranging from command vehicle to troop/cargo carrier, ambulance, communications vehicle and other duties – also making it suitable for civilian government applications. Tow eyes and heavy-duty bumpers allow the Jeep J8 to be easily transported by airplane or helicopter. Arab American Vehicles Company is a manufacturing joint venture between the Arab Organization for Industrialization (51 percent ownership) and Chrysler LLC (49 percent ownership). The plant, a 1.29 million square foot (120,000 square meter) facility located on the outskirts of Cairo was established in 1977 and produced its first vehicle in 1978 (Jeep CJ-6). A workforce of 680 builds 17,600 vehicles annually. Initially AAV was established to serve the Egyptian and Arab military forces by providing them with the American CJ-series Jeep vehicles, the descendants of the world's first four-wheel drive military vehicle, the Willys. After meticulous testing, the armed forces of several Arab countries chose the CJ over other vehicles. AAV also builds Jeep Cherokee (Liberty in the U.S.) for retail sale in the region. AAV-manufactured vehicles are comprised of 45 to 47 percent local content.